Bright yellow, orange and red leaves swirl around us this time of year. It is also close to Halloween and Trick-or-Treaters are busy getting their costumes ready. Many memories of childhood come to mind — dressing up as a lion made out of a large paper bag with orange and brown paint to create my lioness face and mane. Walking hand-in-hand with my brother and sister through the neighborhood hoping to collect a mountain of candy. The following recipe is a truly a worthwhile treat to make, and it’s easy. Squash of all colors is in season, just waiting to be baked, steamed, creamed and transformed into something simple, and delicious. A favorite of ours is Spaghetti Squash. This beauty contains many nutrients, including Vitamin A, beta-carotene, folic acid, and potassium. It is also low in calories and makes a fun substitute for pasta, making it ripe for similar sauces that we normally cook for pasta. The recipe below is very simple, and was enjoyed by all today at lunch. 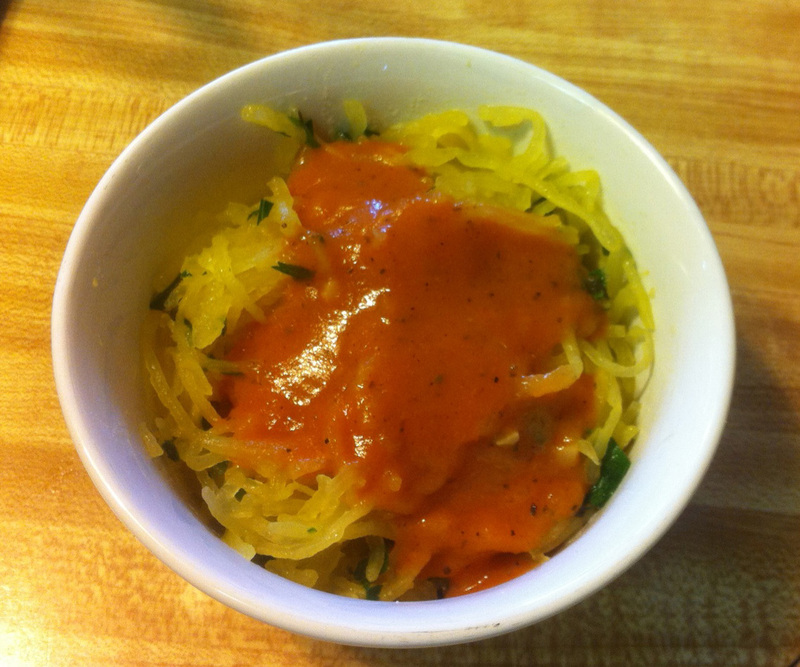 Spaghetti Squash with herb butter and tomato-basil sauce. Ingredients: One Whole Spaghetti Squash, 1 stick of unsalted butter, 1/3 cup chopped fresh parsley and oregano, 3 large cloves garlic finely minced, salt and pepper to taste. Recipe: Preheat oven to 375 F. Wash outside of squash and pat dry. Carefully cut ends off, then stand on straight end and cut in-half lengthwise (you need a large, sharp knife). Scrape out seeds (you can roast these just like pumpkin seeds). Place on large cookie sheet and place with rind side up, then add 1/2 cup of water. Cook until tender, about 45 to 50 minutes depending on the size of the squash. All to cool enough to handle. Use a fork to separate the strands by scraping side to side. Place butter in large, deep sauce pan and slowly melt. Add garlic and simmer until garlic is fragrant (do not brown). Turn off heat and add fresh herbs. Add in Spaghetti squash and gently toss in with herb butter. Salt and pepper to taste. Serve with grated Parmesan cheese and/or your favorite marinara sauce.